Here’s another baking miracle that performs its magic due to air alone—choux paste or pâte à choux. It translates literally as “the pastry for making little cabbages.” Cream puffs are, hands down, the most well-known choux paste descendant. 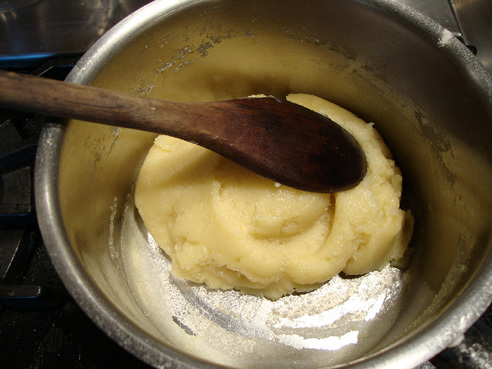 You make the dough by beating flour into boiling water and butter to make a paste—called a panade in French—and cooking the paste over heat while stirring vigorously to drive off excess moisture. Finally, you beat in eggs a little at a time off heat. And that’s it. 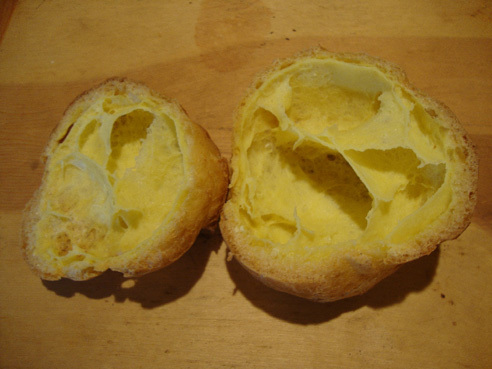 The first time I made it I couldn’t imagine how this warm dense yellow blob—perhaps the most versatile of any pastry—could be transformed into crisp shells for cream puffs, éclairs, and profiteroles, or how spoonfuls rolling around in hot fat would puff up into tender/chewy beignets. And if I mixed some cheese into the paste and baked mounds of it, they’d transform into custardy French puffs of gougères. 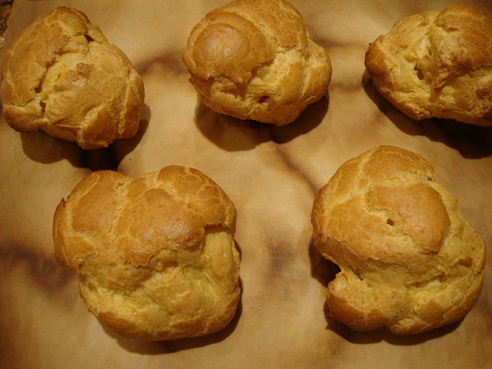 Why does choux paste puff? Because of the air you beat into the eggs—which expands with heat—and the wetness of the dough, which gets converted to steam, making for even more puff. The only equipment you’ll need to make choux paste is a heavy saucepan to cook the panade and a sturdy wooden spoon for beating in the eggs. A food processor or heavy-duty stand mixer can do the work for you, but if you’ve not made pâte à choux before, I recommend the elbow grease approach to give you the feel of what it’s all about. 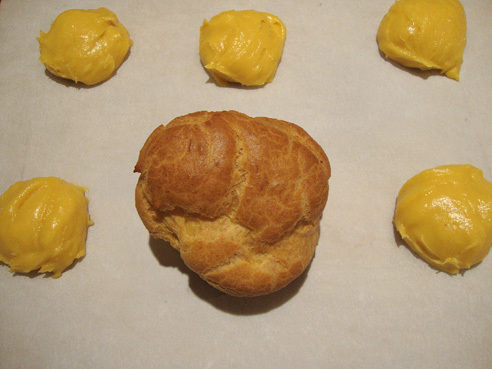 There is no strict proportion of the four major ingredients—water, butter, flour, and eggs—when making pâte à choux. Much depends on the moisture content of the flour, how you measure it, the volume of eggs and even how you measure the water! I’ve made it with 1 cup water (8 ounces), 6 tablespoons butter (3 ounces), 1 cup unbleached all-purpose flour (5 ounces), and 4 large eggs (7 to 7.5 ounces out of the shells), which makes puffs that grow to great heights with crisp shells and tender insides. 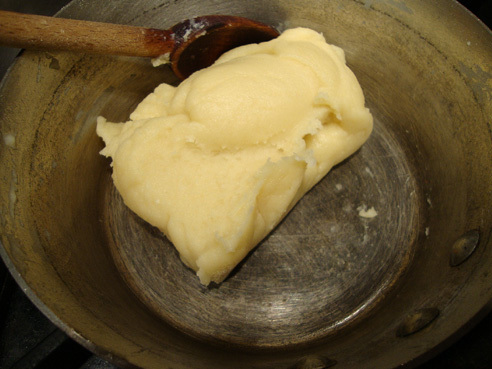 For the liquid, many more recent pâte à choux recipes use water, milk, or a combination, vary the amount of butter, call for bread flour instead of all-purpose flour, and combine whole eggs with extra egg whites. All will affect the size and texture of the puffs. It really depends on what you want to do with the choux paste. 1 cup water (8 ounces), 4 tablespoons butter (2 ounces), 1 cup bread flour (5 ounces), 3 to 4 large eggs plus 2 large egg whites (7.25 to 9 ounces out of the shell). You decide how much egg to add depending on the final texture of the pâte à choux: the pastry should just hold its shape on the spoon with an inch or more of the dough hanging down 2 or 3 inches (see 7th photo in preparation description below). Ultimately, the proportions you decide to use will depend on what you’ll be making. Gougères, which have a definite custardy texture, are best with the first formula, but you might prefer the second one for cream puffs and éclairs, which should be really crisp. Me? I’ve been happily making cream puffs, éclairs, beignets, and other classic French desserts such as Paris Brest and Gateau St. Honoré as well as savory cheese puffs (Gougères), gnocchi, and canapé toppings with the first formula, simply adjusting flavors by adding ½ teaspoon salt to the boiling water and butter for non-sweet recipes and adding 1 tablespoon sugar and a big pinch of salt for sweets. Although I give you cup and weight measurements, I always weigh the ingredients for greater accuracy. You can use salted or unsalted butter. 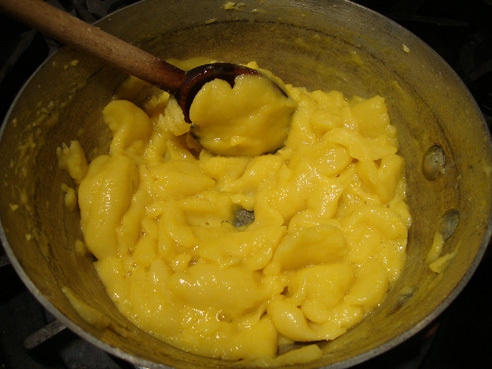 Be sure to warm the eggs in hot water before adding them to the panade or the choux paste will have less puff. 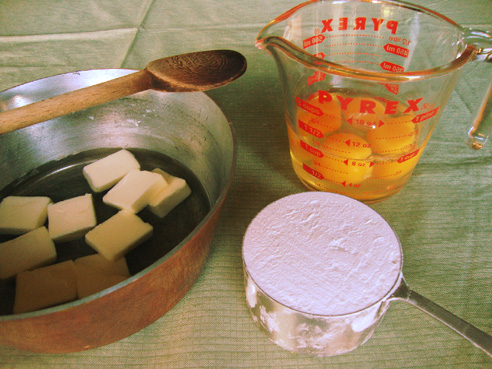 Get everything ready and in place: A 2 ½ to 3-quart heavy saucepan with the water, butter, and seasonings, the flour (measured by stirring the flour in its bin to aerate slightly, dipping a 1-cup dry measure into the flour and filling it to overflowing, and sweeping off the excess with a straight edge), and warmed eggs cracked into a 2-cup glass measure. 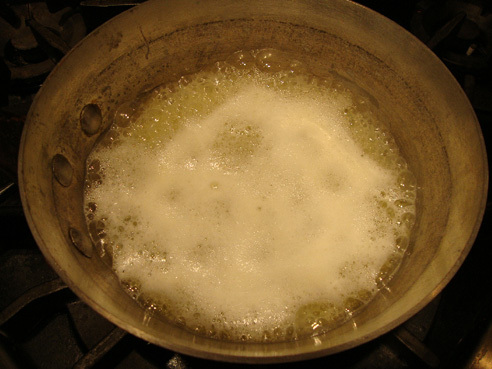 Set the saucepan over medium high heat and bring the liquid to a rolling boil, stirring occasionally. Entire surface should be bubbling vigorously. Immediately take the pan off the heat and dump in the flour. Stir rapidly with a wooden spoon until the flour is completely incorporated and forms a smooth mass of dough. This is the panade. Reduce the heat to medium and stir and cook the panade for 2 to 3 minutes. Press and spread the dough with the wooden spoon to flatten it and increase the surface area to speed evaporation of excess moisture. The dough may film the bottom of the pan with a very thin layer. Take the pan off the heat and continue stirring the panade with the spoon for a minute or two to cool it slightly. Lightly beat eggs to combine whites with yolks. Pour on about ¼ cup of the eggs and mix them in. At first you’ll get a mess looking like lumpy scrambled eggs. 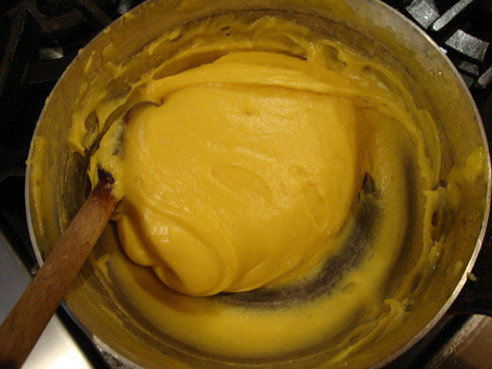 But keep stirring and beating gently until the egg is incorporated and the dough becomes thick and smooth. Continue adding the egg in 3 more installments, beating in each until smooth. 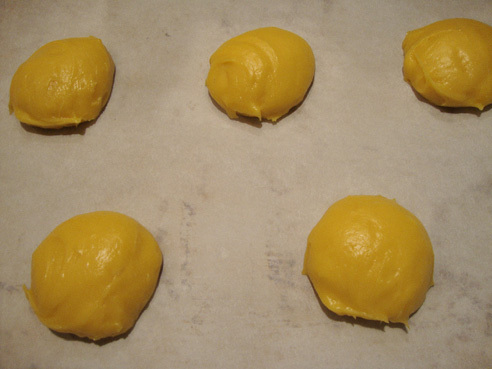 After the last addition, beat about 1 more minute until the pâte à choux is thick and glossy and holds its shape on the spoon with an inch or more of the dough hanging down 2 or 3 inches. 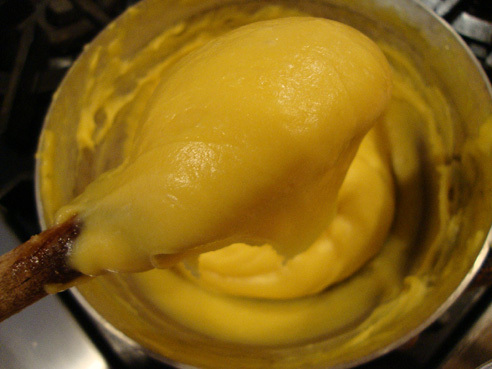 The choux paste is now ready to use. This recipe makes 10 large puffs. Adjust an oven rack to the center position and preheat the oven to 425 degrees. Line two heavy 14 x 17-inch cookie sheets or two 17 x 11-inch baking sheets with cooking parchment. Using soup spoons, one for picking up the dough and one for pushing it off, shape 5 mounds of choux paste on each sheet spacing them 3 or more inches apart. Try to keep the mounds smooth on top. Dip a finger in water and dab a rough spot to smooth it. Each mound should be about 2 ½ inches across and 1 inch high at its center. Coat each mound of dough on the second pan lightly with cooking spray and cover loosely with a sheet of plastic wrap. Leave alone until needed. Bake the first sheet of puffs for 20 minutes at 425 degrees, then reduce the temperature to 375 degrees and continue baking another 10 to 15 minutes or until puffs are huge and nicely browned. They’ll be about 4 inches across and 2 ½ inches tall. Remove pan from oven and stab the puffs on their sides in two places with a sharp paring knife to allow trapped steam to escape. Allow puffs to cool on the baking pan. Return the oven temperature to 425 degrees, uncover the sheet of remaining puffs, and bake and cool as before. Here is a sheet with a few unbaked and a baked puff to compare sizes. With a serrated knife, cut the top third off the puffs and see if the insides have any sheets of soft baked eggy dough. Scoop out any eggy insides with your fingers or a spoon. The reason for doing this is to remove any moisture that could diminish the crispness of the shells. If there isn’t too much of the soft stuff, I usually just leave it alone. Replace tops and cover puffs until ready to fill and serve. 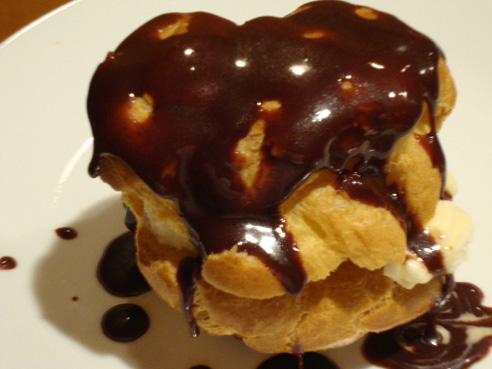 Here’s a puff filled with ice cream and drizzled with chocolate sauce. Eat with a knife and fork. Was there a gougères recipe on Baking Wizard a few years ago? I was looking for it and it isn’t pulling up. Could you post the modifications? BTW-I have always been a big fan. I grew up reading your column in the Missoulian. I was reminded of you when I say a fruit tart recipe in a travel magazine a few years ago. It was an amazing tart, it puts all others to shame. Thanks for being on the web. Thank you so much for writing and for your sweet comment. 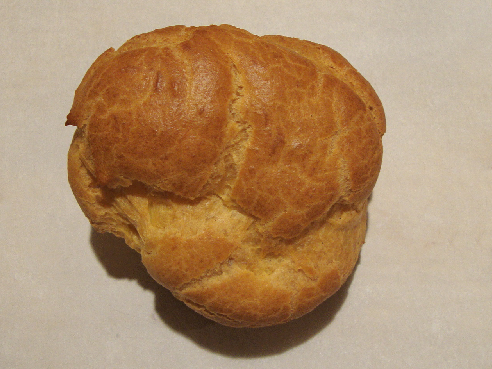 I did have an earlier post on cream puff paste, with a note at the end on gougères. Here’s the link: http://thebakingwizard.com/a-paste-that-puffs/. I recently wrote an article on gougères for Lee Montana Newspapers. I’ll send that to you in an email. Happy baking!